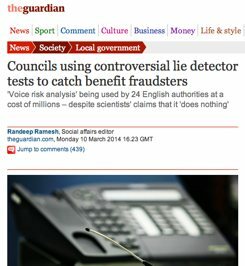 In the Guardian today, we have a story about 20 councils using or planning to use controversial lie detector tests to catch so-called "fradulent" benefits claimants, "despite the government dropping the technology because it was found to be not sufficiently reliable". "VRA [voice risk analysis] is supposed to detect signs of stress in a caller's voice by analysing short snippets of speech, and is still used in the insurance industry to catch fraudsters. Critics say the system is not powerful enough to distinguish cheats from honest callers. False Economy, the trade union-funded campaign group that put in the freedom of information requests to more than 200 local authorities, told the Guardian: 'It says a lot about council outsourcing – and the benefits-bashing agenda – that this pseudo-scientific gimmick is now making its way in through the back door. Capita is a firm with a long rap sheet of expensive failure. Neither they nor their technological snake oil should be trusted.'" Read the whole story in the Guardian. Councils on the 'considering future use' list were generally in the process of procuring a company to run a Single Person Discount review with Capita's bid including VRA (or Capita had already been selected with VRA as an option).